Happy Spring Friends & Family of JD! The 13th Annual Tribute to JD concert is sneaking right upon us! Make plans to be a part of this year’s event , as we've moved back to York County and are holding it for the 2nd time at Jimmy the Greeks in Old Orchard Beach, getting back to basics and featuring some VERY SPECIAL GUESTS! With WBLM providing support again, we are again hoping for a great turn-out! With that being said, get your ticket(s) today and take advantage of placing your order early by getting FREE stuff! If you order your ticket(s) before May 31st, 2015 (ONLY through www.rustyrocket.com or directly to us through the mail), we will automatically mail you a coupon for $10.00 worth of FREE Raffle Tickets (per ticket)! 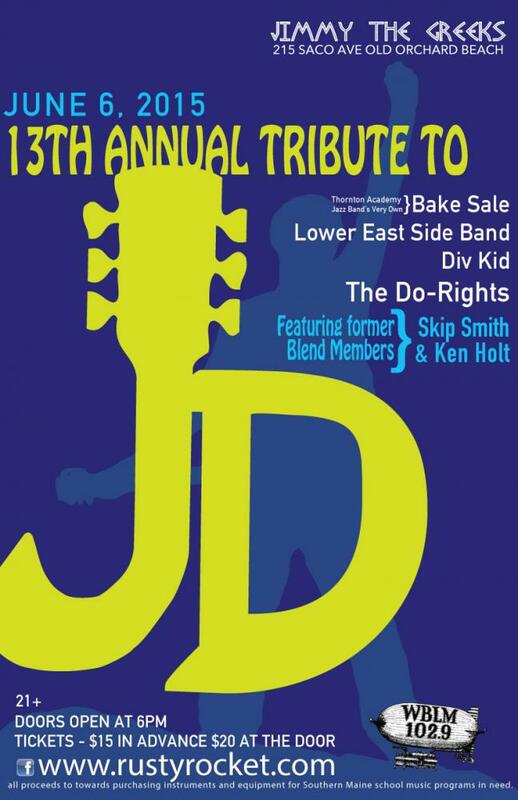 Thorton Academy Jazz Band members, Bake Sale * The Lower East Side Band * Div Kid * AND ON STAGE BY 9:00PM, JD'S FINAL BAND, The Do-Rights FEATURING Former Blend Members Skip Smith & Ken Holt! Please come join us on June 6th, 2015 and enjoy some great music to benefit an excellent cause! We will be selling lots of merchandise, including the new “13th Annual Tribute to JD” t-shirts for all of you who have been collecting them throughout the years! There will also be auctions and plenty of raffles for you all to enjoy! Food buffet (at an additional charge) and drink specials will be available inside the event room, so you will be able to eat and drink WHILE enjoying the music! Pre-order your tickets now! $15.00 a piece in advance or $20.00 at the door – Be sure to order early to get your FREE raffle tickets! 4) Get them at Jimmy the Greeks the night of the show. Regardless, order your tickets today!